So, we’re both giving out two serious thumbs up for this unique departure for Mr. Movie Star Badshah Khan! Go out and catch this special picture, even if it doesn’t have enough music and dancing for Jenny the die-hard. Ha! So I am a Rukhie! Okay, I accept that. And I was very pleased that Shah Rukh has returned with a film I like after the last two disasters ::shudder::. And I like this film on so many levels. I agree, Jenny, that Jabra should have been included; I don’t think that would have been too much music, even for this kind of film which I think the idea was to stay serious to the end. 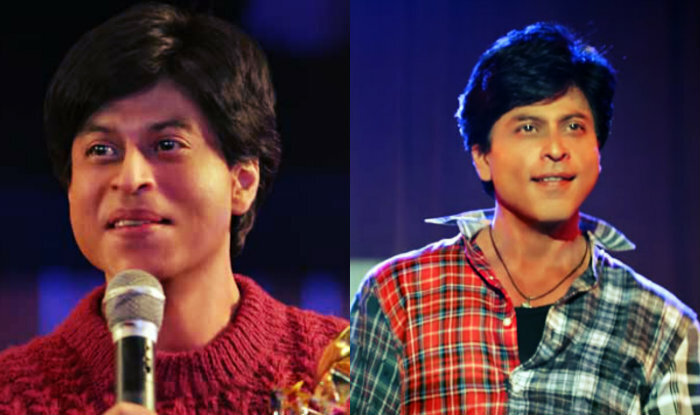 It would have fit nicely with developing the character of Gaurav in the beginning, when he was doing his performances anyway. And since there was the James Bond style chase scene in the film, I don’t’ think adding one musical number would have been outrageous. Speaking of the chase scenes, I absolutely loved the one on the building and I didn’t even mind the across the rooftop bit because the filming was awesome…the camera viewpoint and angles…I loved it which is rare for me because I hate stupid chase scenes that go on and on and on. Now, to the real content of the film. Exaggerated, yes. Realistic, no. But, as far as the idea of idol worship, fandom, stalkers, and psychopathy, no complaints. I really loved the whole “relationship” between Gaurav and Aryan; it rang very true and I speak from experience since I have had fans and stalkers myself being in the public eye through television. 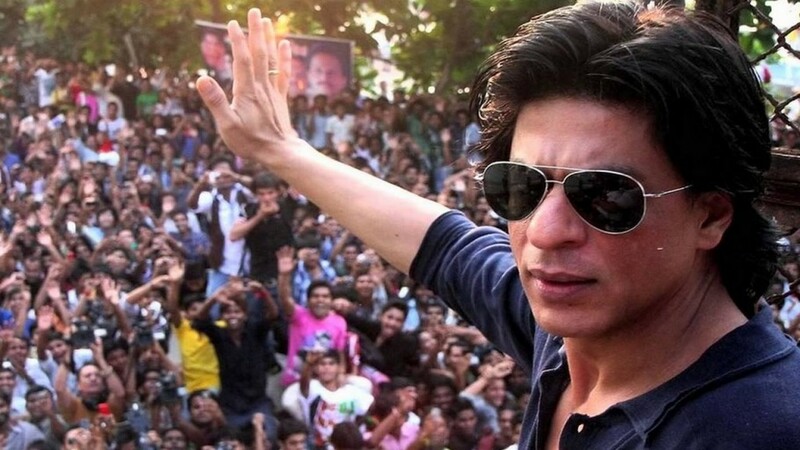 And I have struggled with those same issues and, if I have these issues as just a television commentator, just multiply that by a zillion and you can see what Shah Rukh/Aryan have to deal with. And, yet, being a “Rukhie” as you call me, I am not totally unappreciative of what a fan feels and fantasizes; I am just toned down because I actually DO know what the other side feels and I have worked with people who are stars so I am also aware that my view of my star may not actually be reality. For example, Jenny and Kathy know me from real life and they are not nearly as impressed by me as fans who only know me from television ::laughs::. 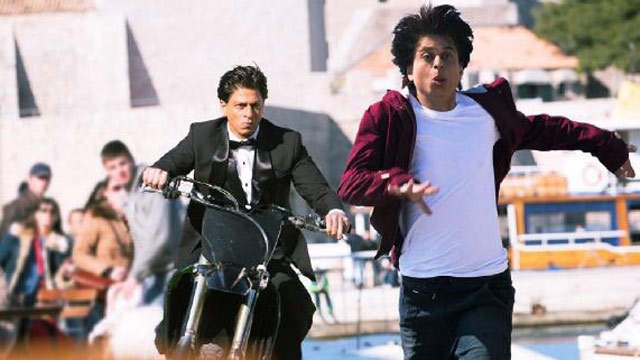 What I like the the most about the movie was that Shah Rukh did not make Aryan totally perfect and Gaurav totally imperfect. He showed that they were both human beings and suffered from emotional issues that relate to fandom and stardom. Gaurav cannot fathom why Aryan can’t give him just five minutes of his time after all the time Gaurav has put in worshiping him; of course, he sees only himself as the one deserving of such time; if he had to stand in line to get that five minutes, he might never have the opportunity. He does not understand the situation from Aryan’s side. And Aryan does not have that much empathy for Gaurev, either as he only sees his side of the equation.Aryan asks why he thinks he even deserves one minute of his life, not recognizing how he, himself, has generated this obsession. So any who saw the film thought that was a pretty harsh thing to say, and it was, but, on the other hand, totally I get it and I have said similar things to “obnoxious” fans. I have fans who think I should give up my time to respond to them; by letter, by email, by phone. I have students who think I should write their papers for me and individuals who think I should give my professional advice for free. They can be very persistent, pressuring me for communication and they wonder why I can be just a little nice and give them just a minute of my time. Like Aryan, if I gave up all my time to these people, I would have no time to do my work (or spend time with my family and friends). And, yet, in reality, I DO give a lot of time to these people, but, not every one of them. I respond via Facebook and Twitter and email and I have had conversations with some at speaking engagements and on the phone, but just not EVERYONE. I am sure Shah Rukh/Aryan has done the same with his fans (just not with ME, dammit!). In reality, I feel he owes me nothing; he has already given me years of pleasure watching his films and years of pleasure just looking at him. But, many fans feel he does owe them more and that is why stars have to have such strong barriers between them and their fans (bodyguards, strong security systems, personal assistants, publicity managers, etc). 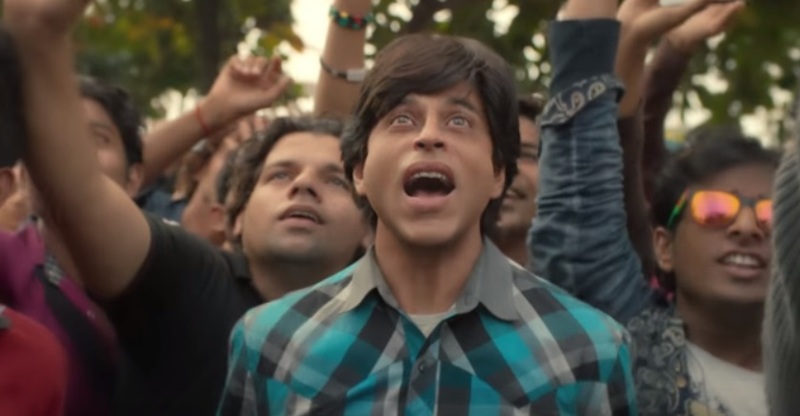 So, I thought Shah Rukh did an amazing acting job with both characters, some of the finest acting I have seen him do. I think the film is brilliant, psychologically (I especially like how Gaurav beat up the actor and thought Aryan should appreciate that gesture), and the point it brought out about stalking, the desire of the stalker to be paired with the object of his obsession; this is absolutely accurate. Sometimes stalkers kill just so they can have the last moment of the object of their obsession’s life and so their photos will be linked together for all time in the media. Creepy, but absolutely dead on. Oh, and as to the ending, I do think Aryan has learned something because as he looks out on the crowd, in his mind, he sees Gaurav. Gaurav, forever, will represent fans to him, in all the good and bad ways and I think Aryan’s experience with Gaurav has indeed shown him that a star cannot truly separate himself from his fans. Definitely some good observations there, Pat. And don’t be offended by the term Rukhie, it’s definitely a term of affection. Heck, my mother was a Rukhie, and proud of it! Good thing I am not a huge Brad Pitt fan like my son-in-law. Then I would be a Pity. Thanks, Pat–the whole nature of extreme fandom is one I barely understand, and yet that is the topic of the film. Why do people feel so intimately connected to someone who is, on the level that they experience them, fundamentally ***not a real person***? Yes, I can admire someone, but how can a fan ever KNOW the reality of their idol despite following them to the level that Gaurav did? Gaurav was so unwilling to admit that he never could know Aryan as a human, and when that was demonstrated to him, he snapped. And when the sheltered (yes) Aryan was confronted with the realization that he COULD be the object of such an unrealistic obsession, he snapped too. Tragedy all around…almost Shakespearean, in fact. Ah, Julia, the fan thing has many weird psychological issues. I remember my first real insight on fame. I was in Atlantic City with my husband and kids watching my brother-in-law fight (he became a world champion boxer). I remember this young women found out that I was his sister-in-law and she came up all excited and touched my arm and said a couple gushy things about her boxing idol and then went off saying, “Oh! That was his SISTER-IN-LAW!” And I remember thinking, “Really?” She got something out of being able to say she touched a relative? And the answer is actually, yes, because, somehow, touching something that had touched or been touched by my brother-in-law was a connection. Fascinating, eh? Pat just forwarded this effects show reel by SRK’s Red Chillies effects company. Though it looks like I was wrong about the dental piece (maybe he just pulled his lower jaw back a touch, hmm) most of the rest of the things we noticed are here. And it’s funny, the first time I’ve ever seen that a retouch was done to erase abs instead of put them in!